In a few day, Jordan Brand will introduce the 28th sneaker in the iconic Air Jordan line with the Air Jordan XX8. 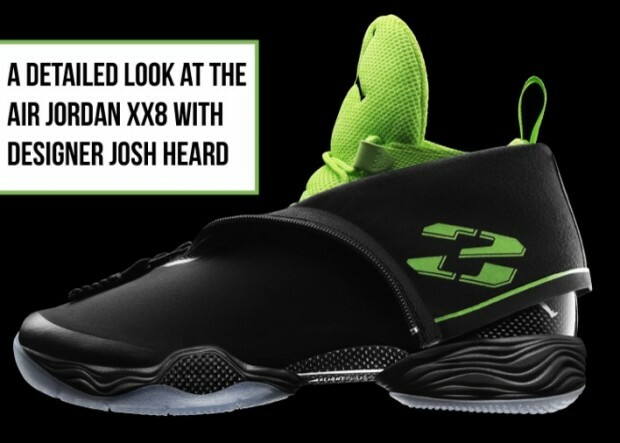 Announced back in December at a launch event in New York City with Tinker Hatfield, Josh Heard, Russell Westbrook, and Spike Lee, the Air Jordan XX8 is swiftly becoming the talk of the town thanks to brand’s latest marketing campaign, #XX8DaysOfFlight. The campaign has done a great job of educating the consumer on the performance aspects of the retro models that have made their way into the lifestyle area of our lives. This is where the Air Jordan XX8 is going to be different from what we have seen in the past. At first glance, most would not even recognize the shoe as a sneaker. First impressions of the model have been mixed, most filled with cries of Jordan Brand losing its way. How could they “let” Tinker do this to the Jordan line? However, since its initial introduction to the public, thoughts about the design of the shoe have slowly changed. Instagram and Twitter are no longer breeding grounds for negativity. The visual aesthetic has grown on us all. Let’s get right to performance, what is the Flight Plate? The Flight Plate is a system made of various parts that allow you to be more energy efficient and more responsive. There are a couple of different components. There is a Zoom air bag in the forefoot and heel, a midsole carrier that stabilizes the product, an outsole that acts as a piston, a full-length Pebax® moderator plate to moderate hot spots from the Zoom, and the midfoot external Carbon Fiber plate which acts as a support structure with the decoupled heel and forefoot. This [decoupled heel and forefoot] isn’t something that we usually do with basketball product, and it is actually something I haven’t seen used in basketball product before. It is meant to actually work with the foot. We did some studies within the Nike Sports Research Lab that showed under high-speed video that the forefoot and heel react much differently within a lateral cutting motion. By decoupling the outsole, we allow the shoe to work more in tandem with the foot. You mentioned the Flight Plate helps you to be more energy efficient. Can you explain how that works? We took a variety of past Nike Basketball product, Jordan product, product from other competitors, and we even researched other energy efficient product and tested them all in the research lab here at Nike for their deflection percentages. Deflection percentage basically tells you the energy efficiency of each part. After testing past product, we found that most were right around the 50% range, with some even as low as 30% which is at the opposite end of the spectrum of where we want to be. 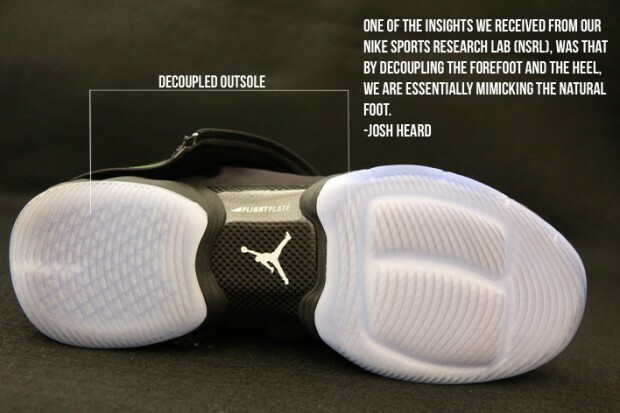 When we measured the AJXX8, we were at the top end of that spectrum. I can’t give you the exact numbers to publish, but I can say were much closer to that 100% than any product we have tested in the past. When you say energy efficiency, is that energy returned to the user? Not really. Think of it this way. Think of your bare foot having 100% energy efficient by itself. Unfortunately, no one wants to play basketball in the bare feet due to lack of cushioning and what not. So with every product you wear as a consumer, you lose energy with every step that you take; unless you have some sort of mechanical piston firing system that is hooked up to batteries or gas powered or something like that. Without that sort of assistance, you are losing energy with every step that you take. So when I reference some of our older product, I can say that the Air Jordan 12 only had a 30% energy efficiency, meaning you lost 70% of your energy with every step that you took. 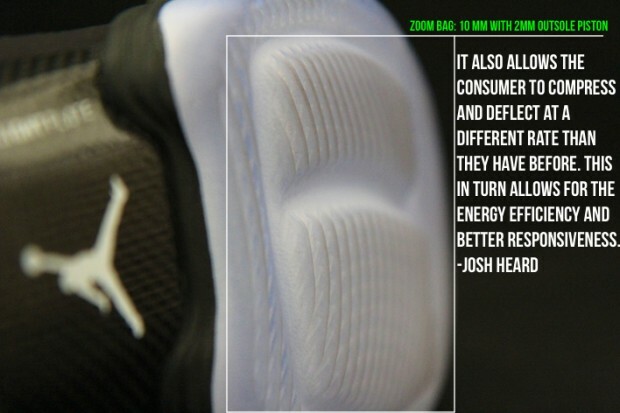 Whereas the Air Jordan XX8 is much higher when it comes to efficiency, meaning that you lose much less energy with every step. And here I was thinking these would help me dunk again? (Laughs) Unfortunately, we can do that unless we provide you with some sort of mechanical system inside the shoe. Getting back on track here, is the Flight Plate made of carbon fiber? A composite? There are two plates in the product [Air Jordan XX8]. The external plate which is more related to the decoupled outsole is carbon fiber. You don’t want to create plantar fasciitis (overuse of the arch tendon in your foot) when your playing causing you foot to bottom out. The external plate that you see is used to prevent that from happening. The Flight Plate itself is actually inside the shoe and it is a full-length Pebax® moderator plate that goes along the footbed. It helps to moderate all the hot spots from the Zoom and makes your footbed nice and smooth. 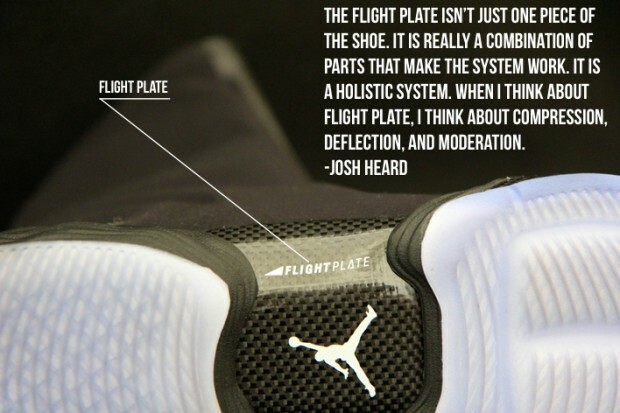 Even saying that, the Flight Plate isn’t just one piece of the shoe. It is really a combination of parts that make the system work. It is a holistic system. When I think about Flight Plate, I think about Compression, Deflection, and Moderation. The external carbon fiber piece that we all see see is really about the decoupled outsole and how it supports you in the arch area. Why isn’t the internal plate carbon fiber as well? The external plate is carbon fiber, but the internal plate is not. Carbon fiber is just too brittle to work with the areas we put it in such as the flex zone. We ended up going with a product called Pebax®. A very resilient, very responsive injection material. So the Pebax® plate is directly up against the Zoom Bag. How does that affect performance? The way that we arrived at the higher efficiency and response was by unlocking the Zoom bags, essentially unleashing the power of the Zoom. By themselves, Zoom air bags are extremely energy efficient; right about the 80%. When we took at look at how we were utilizing them in the past, we would lock up that energy by encapsulating it in foam. So it allowed the fibers and air to really go nowhere. That made it feel like the Zoom wasn’t really as energy efficient. When we tested it, we found that in certain instances it was [energy efficient] because of certain combinations such as double stacked bags, but when you really got it by itself and encapsulated it in foam, it really wasn’t. So we cored out foam around the Zoom air bags in the forefoot, though we do have some foam touching in the heel, so it allows for the piston effect to happen on the bottom side when the user compresses it. They’re compressing that piston and taking full advantage of the traction areas in the forefoot so that you don’t have any stability or traction concerns. It also allows the consumer to compress and deflect at a different rate than they have been before. This in turn allows for the energy efficiency and better responsiveness. How many Zoom bags are there in total? Two in the front and one in the rear? There is actually only one bag in the front but it is decoupled. It’s a bit of a butterfly bag that allows for better articulation. When you are going into that lateral cut movement, that bag will actually articulate a little bit with you. However, they are connected. Its a two film bag with the Zoom fabric in the center. The forefoot bag is 10 mm, with 2mm in the piston, and the rear Zoom is 14mm. Lets talk about decoupling. Lets talk about exactly what that means? The whole goal of this product was get the shoe to move with your foot and not against it. When we looked at the high speed video and compared a bare foot to a foot that has our product on it, we noticed that the product wasn’t working in tandem with the foot. One of the insights we received from our Nike Sports Research Lab (NSRL), was that by decoupling the forefoot and the heel, we are essentially mimicking the natural foot. They took high speed video of people doing cut motions as well as linear motions and determined that the forefoot and the heel are acting very independent of each other, particularly in that lateral cutting motion. With this product [AJXX8], we wanted to allow for that same motion so that it is working somewhat with your foot and not against it. There is also carbon fiber on the heel counter. How does that affect performance? That piece is actually an additional support feature. If you actually look inside the booty of the shoe, there is an internal heel counter that is combined and is one piece. It is not two separate pieces like the external support. The single piece is a basketball best practice to allow for that singular heel counter and that heel cup to protect you. The external pieces of carbon fiber are more of a reinforcement and a protection piece around your heel and around your malleolus area. Otherwise, it’s also there for aesthetics. Does the same apply to the piece on the lateral forefoot? 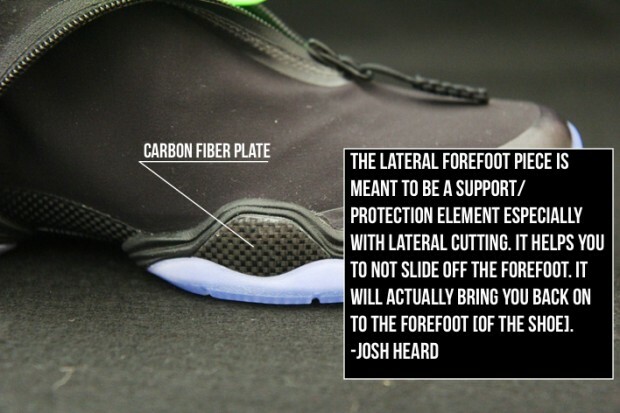 The lateral forefoot piece is meant to be a support/protection element especially with lateral cutting. It helps you to not slide off the forefoot. It will actually bring you back on to the forefoot [of the shoe]. What is the lockdown like on the Air Jordan XX8? Are the fingers we see attached to the strobel board? We actually minimized the strobel board as much as we could so that it would go under the feather edge of the last, which most products do not do. We coupled that with our fit system, known as Dynamic Fit. We combined two materials, one a very durable, non-stretch, ballistic type nylon with a very stretchy material in the center. The durable material goes all the way down into the strobel board and is articulated through the fingers so that when the user puts it on they feel like they are getting a 360 degree lock down around their foot. The mesh in between the fingers is meant to be stretchy and articulate so that it can move with your foot. While your foot is moving those fingers are moving with you. How doe the shroud affect things. Is it strictly an aesthetic piece? Well it is certainly an aesthetic piece. Its a 7 ½ inch shell that really hasn’t been done in a basketball shoe before. It is also there for protection. From a proprioception standpoint, if you look at a lot of guys in the NBA, and even in college nowadays, a lot of them are wearing ankle braces to protect themselves. I’m not going to say that this shroud acts as an ankle brace, but it certainly gives you that feeling when you have it all they way zipped up. And that definitely helps. We see it as a shoe within a shoe. The shrouded zipper just brings it all together. It definitely is an aesthetic play, it definitely lends itself really well to a blank canvas of graphics. At the same time, I do know that it is functional for those players that want to zip it up and play. It is really up to the players. I have seen it all the way up, some with it down, some wear it somewhere in between. In all of those scenarios, the shoes has played out stellar so we know it performs. How does the Zoom in the AJXX8 compare to the full length Zoom in the LeBron X? I haven’t worn the LeBron X, but I can say that on the Air Jordan XX8, that all the consumer has to do is put it on and they will feel the difference and that it is much different than any product they have ever tried. The forefoot in particular, with that piston effect and that Zoom reaction, and that responsiveness coming from the Zoom, is unlike any product that I have ever developed and I have been designing for the last 18 years. I don’t think that any other product in the marketplace is going to compare to this right now. Finally, let’s end on traction. What’s happening with the Air Jordan XX8? This is our stand indoor rubber product that we use on all of our basketball product. It does have a new design. It was designed by Rob Bruce, who took his inspiration from money. It you take a $20 and look right around the head of Andrew Jackson, you’ll see these connected lines and that is where Rob got his inspiration for the design. We have had great feedback about the traction ever since the first tool that we made and kept it all the way through. It was a very cool product to work on. I feel like there are so many things involved that it is good to get the word out. I encourage people to try them on and walk on a hard surface. That is what I recommend to anyone that really wants to feel the difference. The Air Jordan XX8 officially releases on February 15 in Houston, TX over All-Star Weekend, and will be available nationwide starting February 17th. Pricing is set at $250.